This is the philosophy of artist Pete Garcia, who is also a founder of I.D.E.A Partners, LLC. 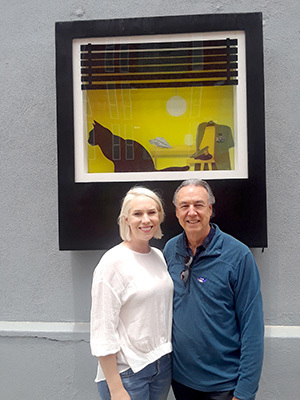 Garcia and his partner, David Malmuth, formed the development firm 10 years ago with the dream of bringing their I.D.E.A concept to the Downtown’s East Village. I.D.E.A. is an acronym which stands for Innovation + Design + Education + Arts. The plan is to bring 13,000 design and tech jobs over the next 12 years to a part of the East Village dubbed the I.D.E.A. District. Garcia and Malmuth are also responsible for the creation of IDEA1, the first apartment community of the I.D.E.A district; which features apartment homes, commercial space and live/work lofts. Recently, Garcia joined forces with fellow artist Kate Goodson to create a unique public art installation on the southern wall of the Salvation Army building at the corner of Park Boulevard and E Street across from the IDEA1 complex. Goodson is also Founding Principle of Pop Arch, a place-making design studio located in North Park that specializes in working with neighborhood planning groups and business improvement districts to create urban public spaces such as parklets. Both Garcia and Goodson have made major career goal changes since their college days. Garcia originally studied as an engineer and Goodson as an architect before they both decided to explore their artistic impulses. “I was actually a neuroscientist at Tulane University in New Orleans before I switched to architecture,” said Goodson. Both still use their original expertise to complement their artistic streak. Goodson was introduced to Garcia by his wife, Beth Callender, who works with him as a co-founder of Urban Interventions, a nonprofit dedicated to creating public art installations. She recommended Goodson when the art project was offered to Garcia through the San Diego Downtown Partnership. Urban Interventions funded two-thirds of the project with San Diego Downtown Partnership picking up the remaining third. The project is called “Window Stories’ and features four lightbox panels designed to look like apartment windows. Each panel has its own theme and it is left to the passerby to interpret that story. The pieces include characters and props that are clues to the storyline. This came as a natural process for Garcia who has numerous writing and producing film credits from his days in Hollywood where he worked for Disney among others. The frames also feature sound effects, which are triggered by the motion sensor. Even the credit box, which accompanies the art display, is designed to look like a billing block from a motion picture. The artistic duo has labeled their project as “tactical urbanism” because they created high impact art at a low cost. The art project has served as a catalyst for additional beatification because the Salvation Army created significant landscaping and structural improvements as a result of the display. This has transformed a blighted avenue into a vibrant new public passage. And that is the result that both artists were hoping to achieve. — Vince Meehan can be reached at vinniemeehan@gmail.com.